Sri Dilip Kumar Roy was a remarkable truth seeker and God Lover. Through his multi faceted spiritual and artistic qualities, he inspired many to lead a spiritual life of greater harmony, peace and love. Dilip was rare in combining the keenest intellect with the purest devotion of a Bhakti devotee. Dilip was a brilliant scholar, gaining a Tripos in Maths from Cambridge University. He also maintained a friendship and correspondence with the great humanist and philosopher Bertrand Russell. However the dazzling academic brilliance of Dilip’s mind did not satisfy his heart’s deepest urge, to experience the presence of God. After a certain amount of deliberation, he forsook a materially prosperous life to enter under the guidance of Spiritual Master, Sri Aurobindo. In his book Sri Aurobindo Came to Me He recalls with great humility and openness his joys and trials of being a spiritual aspirant. He fondly recalls the guidance and inspiration of his ever patient and compassionate Guru. Dilip’s rare accounts of his many conversations and letters with Sri Aurobindo give a most welcome insight into the spiritual direction Sri Aurobindo gave to his dearest devotee. This quote from Savitri, selected by Dilip in his autobiography (2), encompasses the sentiments of his early spiritual tutelage. Dilip also maintained close friendships with some of the leading contemporary spiritual and humanitarian figures. In his book Among the Great he shares his thought and interviews with Romain Rolland, the artist; Gandhi, the Saint; Betrand Russell, the thinker; Rabindranath Tagore, the poet and Sri Aurobindo, the Seer. Dilip was also very close to Sri Krishnaprem a British army officer who fully embraced Vaishanava Hinduism. It is testament to Dilip’s fully blossomed human nature that he connected with such a diverse range of luminaries. Your destiny is to be a Yogi but an ascetic dryness or isolated loneliness is not your spiritual destiny since it is not consonant with your swabhava which is made for joy, largeness, expansion and a comprehensive movement of the life force – Poetry and music come from the inner being. Dilip was a supreme singer and musician. His soul stirring songs transport the listener to a realm of heavenly delight, far beyond the domain of worldly thoughts. The source of his music remains a divine mystery but his golden voice unreservedly captures the hearts of those who listen. As Mahatma Gandhi said of him. I may make bold to claim that very few persons in India â&#128;’ or rather in the world â&#128;’ have a voice like his, so rich and sweet and intense. 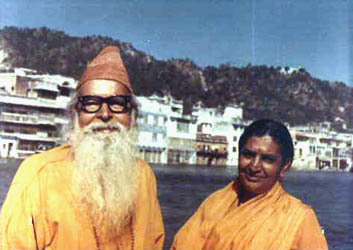 During his life in the Ashram, Dilip most gratefully acknowledged the help and inspiration of his daughter disciple Ma Indira Devi. Indira was a mystic in her own right and devoted to the ideal of harmony, love and devotion. (1) Sri Aurobindo Came to Me â&#128;’ not strictly his Autobiography, although some people refer to it as autobiographical in nature.